If you've ever had pickled red onions than you understand. There is something about the crisp, sweet and sulfery taste that perfectly compliments a sandwich. If you love caramelized onions than these are their uncooked, summer time, brethren. 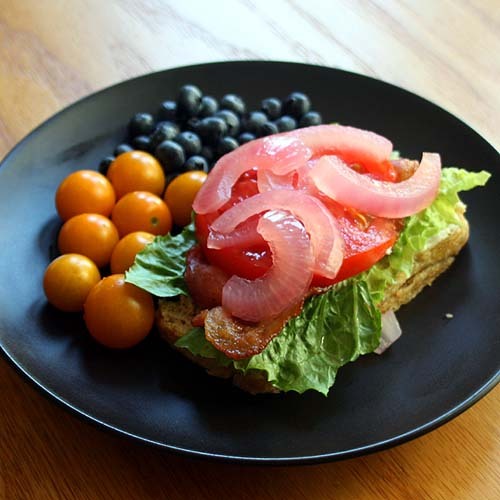 BLTs are even better with pickled red onion. Served with a side of 'Sun Gold' cherry tomatoes and the last of this summer's blueberries. If you've never had them I highly recommend you make yourself a jar pronto. Then you too will understand. 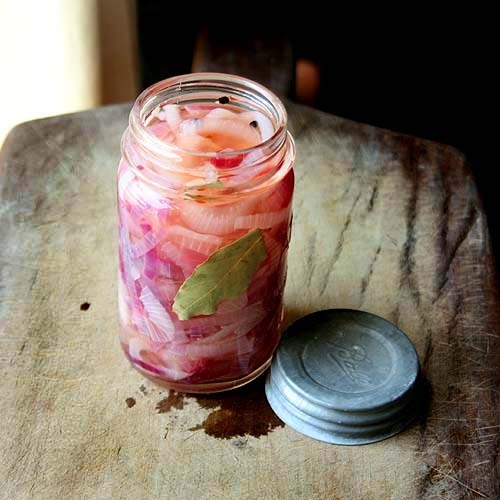 Pickled red onions can also be served on salads, pizzas or eaten straight out of the jar. They are addictive. Consider yourself warned. There are a variety of spices and different types of vinegar used. I decided to keep it simple and go with apple cider vinegar because the slight fruitiness adds some depth. I probably would have tried red wine vinegar if I had it on hand. For spices I chose bay leaves and whole black pepper. Although I'm not even sure if those are necessary. Below's the recipe for what I came up with. I have made it several times now because I keep finding an empty jar in the fridge. And lucky me the co-op has red onion in the shares recently. Aren't they pretty? Two onions of a medium size are just right for one quart of pickles. You could use a mandolin if you have one. I just used a chef knife. 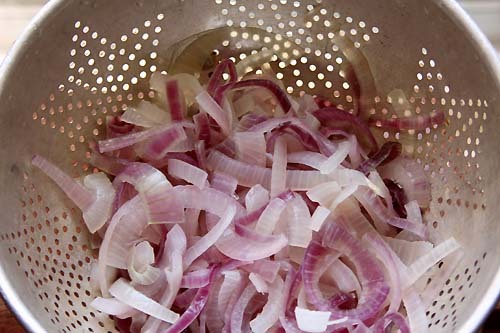 Then blanch the onions to halt any enzymes that are working to age your onions. Blanching also makes them a little soft so you can cram more into the ball jar. 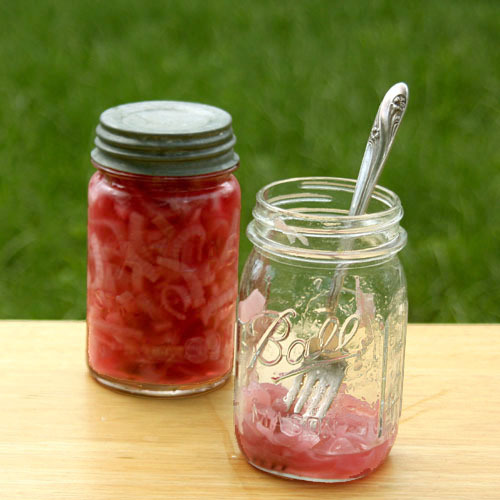 By the way, you should sterilize the jar and lid. One way to sterilize is pour boiling water over them. 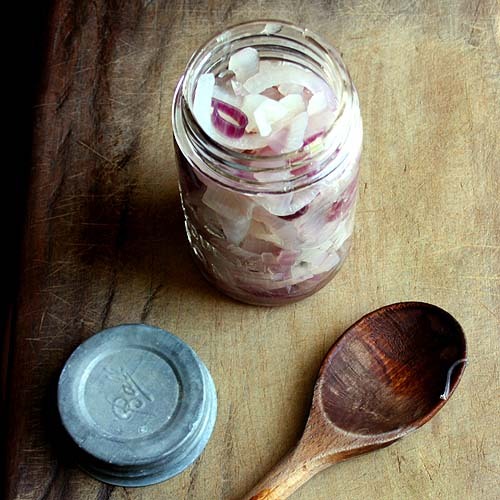 Use a wooden spoon or other blunt object to stuff all the onions in a jar. Try not to be too brutal and bruise them as that diminishes the crunch factor. Then heat the apple cider vinegar with the sugar and spices until just simmering. (Don't let it cook too long or the water will start to evaporate and make the ratios all wonky.) 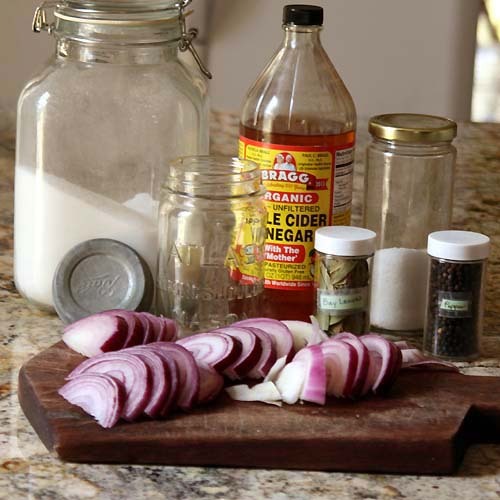 Pour the hot vinegar solution into the jar until it covers all of the onions. Put a lid on it and let on your pickled red onions and let them cool on the counter before popping it in the fridge. It takes a full day for the flavors to develop and the color to become a solid bright fuchsia. And let's face it half the fun of these pickles are their lurid color. What do you want to eat your pickled red onions with? Sterilize your jar(s) by running through the dish washer, pouring boiling water over them, or submerging in boiling water for 10 minutes. Blanch the onion slices by submerging them in boiling water for three minutes. Then shock them in a cold water bath for 3 minutes so they don't over cook. Then stuff them into your prepared jar. Meanwhile, heat the vinegar, water, sugar, salt, black pepper and bay leaf in a saucepan until the sugar has dissolved and everything is just starting to simmer. Do not cook too long or evaporation will ruin your ratios. Pour the vinegar mixture over the onions in a jar. If there is too much discard the extra, but pack the loose spices into the jar. Let cool to room temperature on the counter. Put in the refrigerator over night and they are ready to eat. What a great topping for sandwiches. Can you can this recipe and how long would you process the jars if so? I looked up the time in the Ball Blue Book of Canning and Preserving. They have a similar recipe and I'd use that processing time which is 10 minutes if you are under 1000 ft sea level. Ohhh, I hadn't thought of chili, I'll be trying that this fall! I'd be interested in canning them too. I would think 10-15 minutes in a boiling water bath - but I always check the National Center for Home Preservation if in doubt - they have all the guidelines listed. Have you canned them before? Must I cook them ahead of time f I'm canning to preserve since they'll be processed for a min of 10 or 15 minutes? Yes, I would blanch the onions because it makes them easier to pack without damaging. Although I suppose it isn't a must. I'm sure they would be safe to eat if you start with raw onions. Make sure to use the vinegar solution hot, processing cold jars could cause breakage. I want them on a crusty baguette with delicious cured meats! I love onions and I love pickled onions. These are amazing. I just wanted you to know that I included your recipe in a post about onions. I will be tweeting and pinning it all this week. Fun! 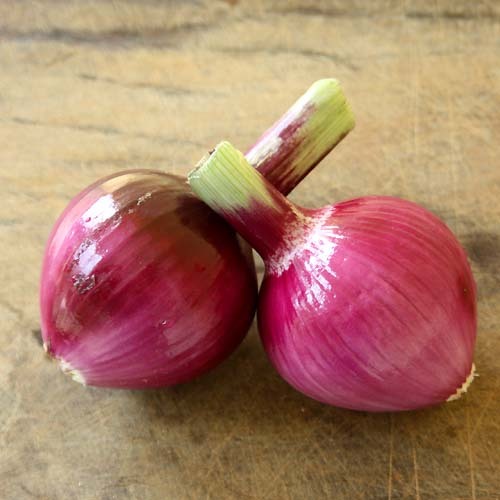 I am with you on the awesomeness of onions and all the allium family for that matter! I had these at Foy's house 2 summers ago and finally got around to making them for myself because they're so good....I made a double batch and used 2 quart jars, not pints.